Encourage your students to stay active at recess with this cool playground set from Kidstuff Playsystems. Unlike traditional designs, this set is styled as an obstacle course that's just full of challenges for kids of any size. This is a great opportunity for students to organize races and challenge themselves to improve every day. 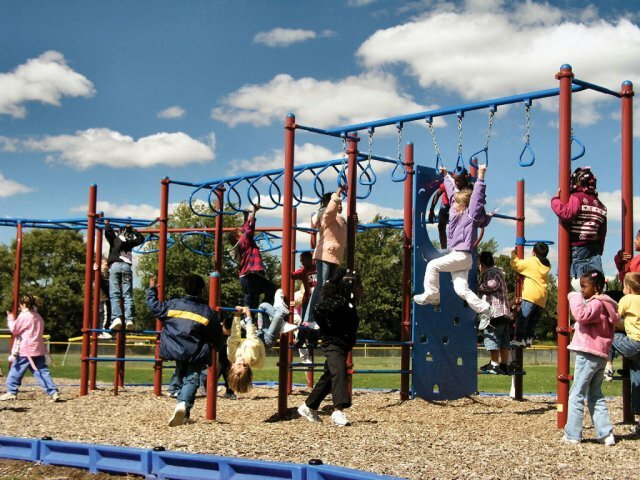 Your students will just love swinging from monkey bars, horizontal ladders, twists and more. While they are having so much fun, they won’t even realize they are developing critical upper body strength. This playground obstacle course is designed for long-term enjoyment. The rotation-molded platform will not rust or pull apart. Even in the hot sun, this playground resists fading, so you can encourage children to go out and have a blast for many years to come. Outdoor Fun: Extreme obstacle course play area encourages students to exercise. Exciting Design: Includes 9 ground-level events, so there is always something new to enjoy. Safe Choice: Meets all government safety and ADA guidelines. No sharp or rough edges.